Paperback, 8.5 x 10.75 in. / 160 pgs / 200 color / 50 bw. Edited by Christina Gräwe and Peter Cachola Schmal. From the Tower of Babel to the Leaning Tower of Pisa, from European cathedrals to the Twin Towers and the currently scandalous Freedom Tower, highrises have always been a symbol of mankind's cultural aspirations and technological achievements. 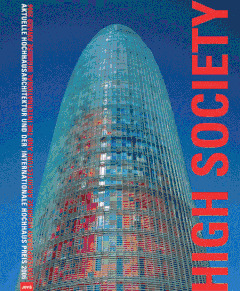 The biennial International Highrise Award specifies that an ideal contemporary tower should make exceptional use of aesthetics, design and technology, and show cost-effectiveness, sustainability and integration into town planning. This album of the 2006 contenders honors foremost the winners, Jean Nouvel and Fermin Vasquez, who designed the Torre Agbar building in Barcelona. The Agbar Tower's distinctive rounded crown had already earned it a nominee spot in Cabinet Magazine's Most Phallic Building in the World Contest. Here, the Highrise Award's more serious honor cites the building's "expressive shape," "pulsating dynamism" and "a multi-layer outer skin that generates its varied and exciting appearance." Runners-up include Santiago Calatrava's Turning Torso in Malmo, Sweden. FORMAT: Paperback, 8.5 x 10.75 in. / 160 pgs / 200 color / 50 b&w.